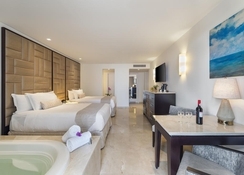 Nestled in the lively resort of Playa del Carmen stands the majestic Playacar Palace, an all inclusive luxury hotel offering ultimate comfort and warm hospitality to all guests – couples, families and groups. Overlooking pristine sands and the Caribbean Sea, the hotel offers an exotic away-from-it-all feel while still being steps from the town centre and popular Quinta Avenida bustling with shops, bars and restaurants. 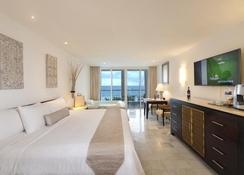 Exuding style, elegance and contemporary charm, Playacar Palace's stately suites are finished with state-of-the-art technology, comfortable beds and first-class amenities so guests can relax. 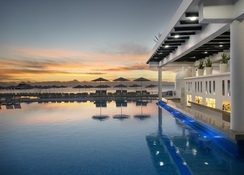 The hotel offers a medley of great daytime and evening facilities to get involved in, whether you want to chill out by the swimming pool, hit the fitness centre or tennis courts, unwind at the spa, or treat the kids to a spectacular Dolphin swim by using the available resort credits. The food and drink scene at Playacar Palace serves up gorgeous International cuisine from world-class chefs, with three fantastic venues sure to impress – and in addition, nightly entertainment shows offer plenty of fun for the whole family. Located in Playa Del Carmen, Playacar Palace is minutes away from the lively cafes, bars and restaurants of Quinta Avenida (Fifth Avenue). This hotel is approximately an hours' drive from Cancun airport, which is 51km away. The resort has 201 well-appointed suites. These rooms come with air-conditioning, flat screen TV, iPod docking station, coffee maker, mini-bar, spirits optic, in-room safe, iron and ironing board, double Jacuzzi bathtub, bathrobe & slippers, turn-down service, hairdryer and hair straighteners. All rooms offer free WiFi. Rooms are categorised as Deluxe Resort View, Superior Deluxe Partial Ocean View, Superior Deluxe Ocean View, Honeymoon Suite, Concierge Level, Sand suite and Governor Suite. 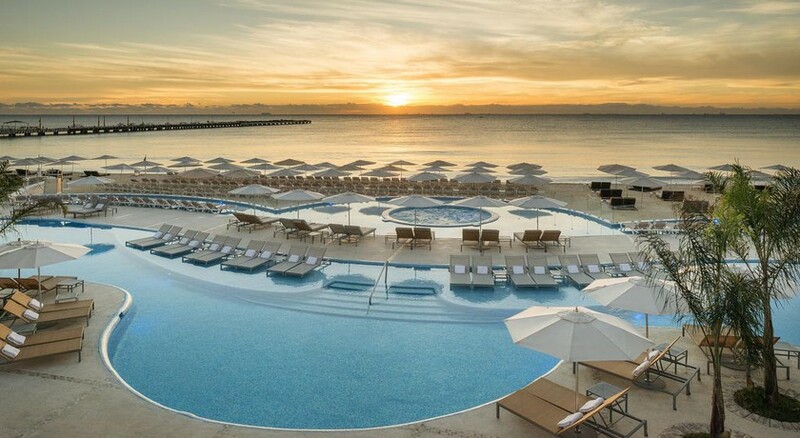 Playacar Palace includes several world-class restaurants serving mouth-watering delicacies with the freshest ingredients. Café del Mar is the main buffet restaurant serving all major meals, Terraza is an Italian a la carte restaurant, and Mo-Mo-No-Ha-Na is an Asian restaurant with a sushi bar. The several bars here – Lobby Bar, Luna Lounge, Aqua Bar offer delicious cocktails. 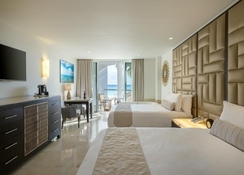 Playacar Palace offers its guests ample opportunity for recreation and relaxation. There is a swimming pool with a swim-up bar and children’s section. There is a delightful spa offering a range of treatments & therapies and a fully-equipped fitness centre. There are facilities for sports like tennis, beach volleyball, giant chess, cycling and water sports at the beach. Children can have fun at the kids’ club (4-12 years). You could also stroll around and explore Quinta Avenida’s bustling streets. 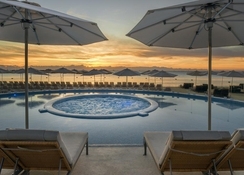 To add to the fun, the hotel provides Resort Credit of $1,500 USD on every booking for five nights that can be used by guests for spa and beauty salon treatments, golf outings, tours, dinners and dolphin swimming excursions.